It’s almost time for race day! 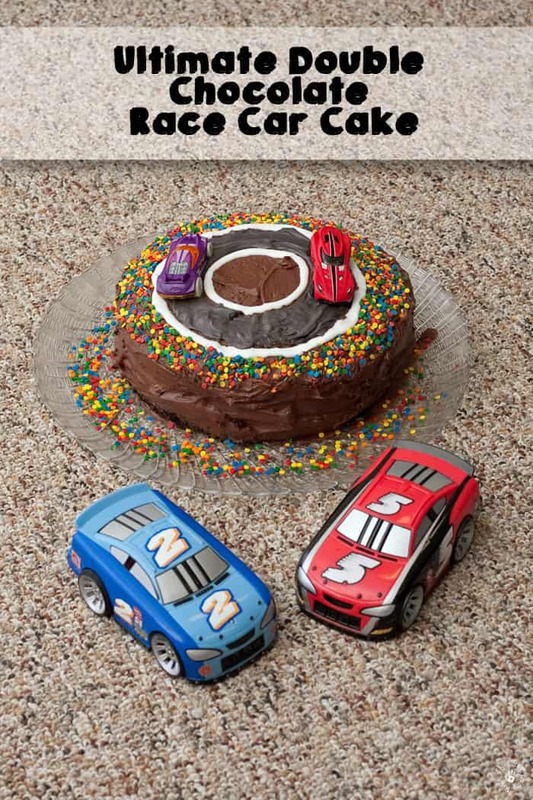 The boys have really been into race cars recently so I thought that it would be fun to really go all out and create a race-themed party. 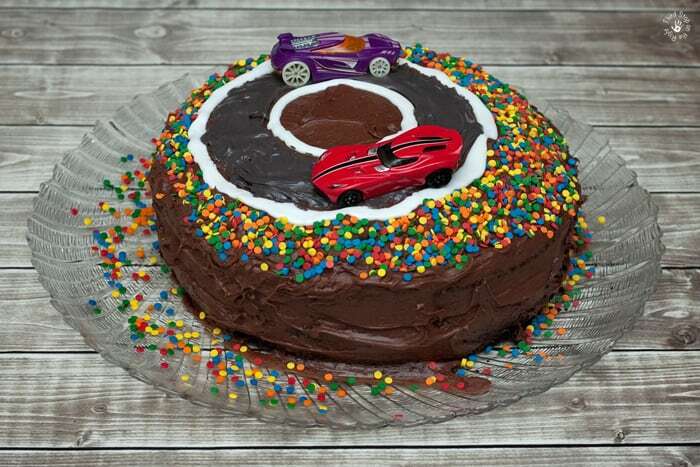 One of the things that the boys liked the most was the double chocolate race car cake! This cake was a focal point of our party and not only was delicious but it turned out so cute. I began by mixing the chocolate cake mix according to the directions on the box. 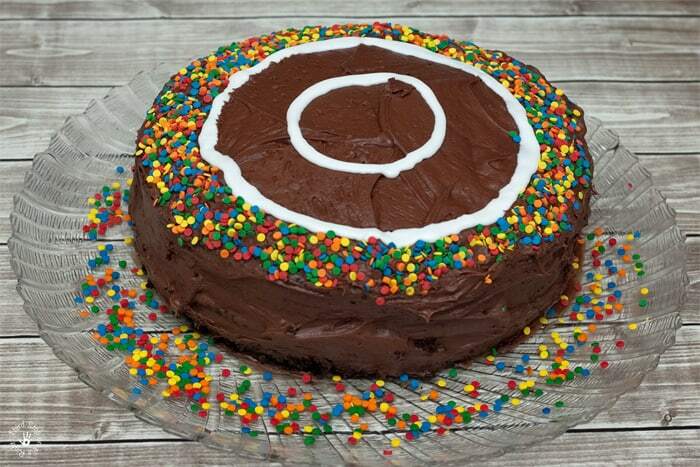 I split the batter between two 9″ cake pans. After the two cakes have cooled, remove them from the pans. 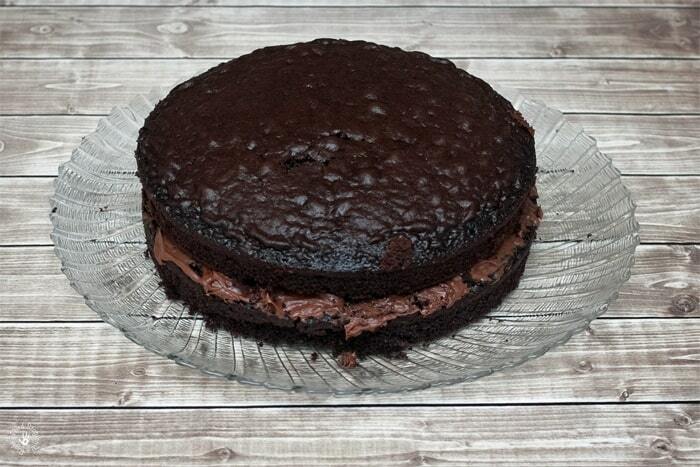 Put a layer of the chocolate frosting between the two layers. 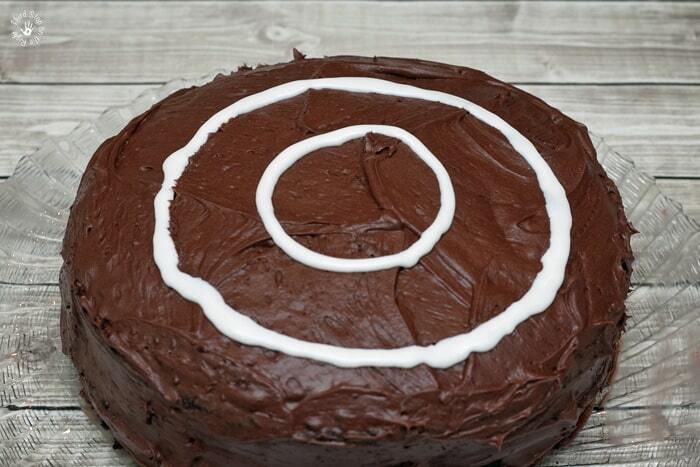 You will then want to frost the rest of the cake with chocolate frosting. To create the outline of the track, I used two bowls (one larger and one smaller). I pressed the rim of the larger bowl into the center of the cake and removed the bowl. Then using the white icing I traced the outline of the bowl. Using the smaller bowl, I did the same thing, and outlined it with the white icing. 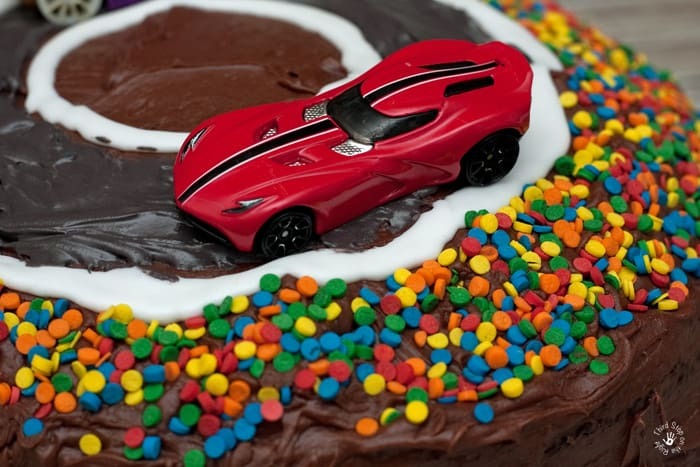 Using the multicolored circular sprinkles, I placed the sprinkles all around the outside of the track. These sprinkles are meant to look like the crowd in the stands. I then mixed a small amount of the black icing with the white icing to create a dark grey color. Using a small spatula, I filled in the area between the white lines for the track. I then placed two die cast “race cars” on the track. Not only does it now taste delicious, but it also looks so adorably cute! However, did you know that chocolate is one of the biggest causes of heartburn? The caffeine in chocolate as well as theobromide can keep the lower esophageal sphincter muscle from tightening and allowing reflux. This means that those decadent chocolate treats can come back to haunt you later. The new easy to swallow tablets allow you to be able to enjoy your favorite foods, whether rich or spicy, as you are cheering on Ty Dillon in car #95 on race day! Nexium 24HR gives you all day, all night frequent heartburn protection. It may take 1 to 4 days for full effect. Use as directed for 14 days to treat frequent heartburn. Do not take for more than 14 days or more often than every 4 months unless directed by a doctor. Not for immediate relief. 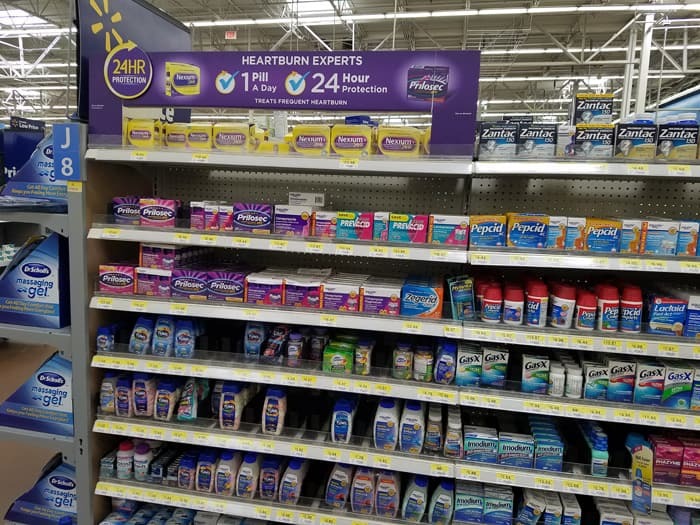 You can pick up Nexium 24HR in the pharmacy section of your local Walmart as well as any additional race day essentials. Also, be sure to download this money-saving coupon for Nexium 24HR before your next shopping trip! 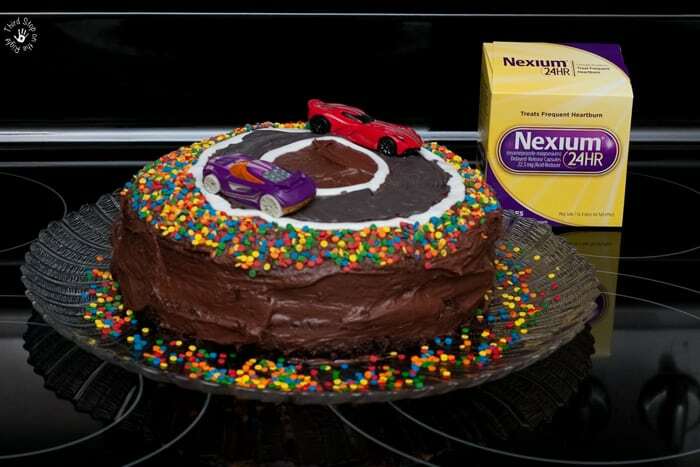 Comment On: What is your favorite race day food the Nexium 24HR can give you relief from?